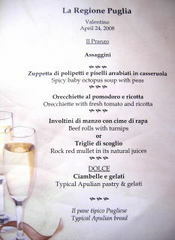 TableConversation.com is going on vacation, or rather, to work, prospecting for new restaurants, wines and recipes. Keep posted until I post again, toward the end of May. I tend to scorn microwave cookbooks. They seem practical and dull, oriented toward machines rather than food. The frequency with which they turn up in thrift shops indicates that others feel the same way. Nevertheless, I bought a microwave cookbook recently. Of course this one is different, exotic and fun. I picked it up at Higginbothams in Chennai (Madras), a grand, high-ceilinged place that that is India's oldest book shop. The book is “Cook and See. Part 5,” published by S. Meenakshi Ammal Publications in Chennai. The recipes cover north and south Indian dishes and continental food, a legacy of the British. All are vegetarian. I have to admit that she is right, judging by her book at least, and my long-standing prejudice is wrong. The recipes work, with minor changes that may reflect the difference between microwave ovens in India and the United States. 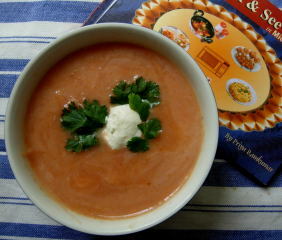 And they are delicious, like this cream of tomato soup, which I have adjusted slightly for American cooks. Combine the tomatoes, onion, potato and carrot in a microwave proof deep bowl. Sprinkle with ½ cup water. Cover and microwave on high 8 to 10 minutes, or until the vegetables are tender. (In my oven, this took 15 minutes). Blend the mixture in a blender (or with a hand blender). Put through a sieve to remove seeds and peel. Stir the cornstarch into the milk until smooth. Add this to the soup along with the sugar, salt and pepper. Add 1 cup water, or more if needed to thin the soup. Cover and microwave on high 3 to 4 minutes (8 minutes in my oven) until heated through. Stir well. Ladle into heated bowls and garnish with a swirl of cream and cilantro. Variations: Season with ½ to 1 teaspoon garam masala. Add canned sweet corn. Garnish with croutons. 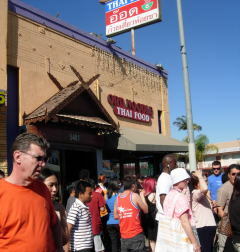 The eye-popping red and yellow sign outside announces that Chai Toong serves E-San (northeastern Thai) food. The regular menu shows little of that but sounds pretty much like what you get at Yai, a long-established Thai restaurant in Hollywood. This isn’t a coincidence. 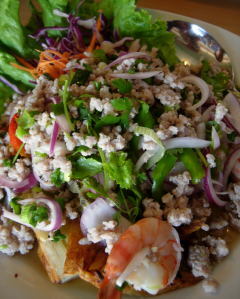 Yai’s head chef left to take over Chai Toong, which is on Vermont Avenue just north of Los Angeles City College. What they still share is location: Yai has a second branch farther north on the same street. 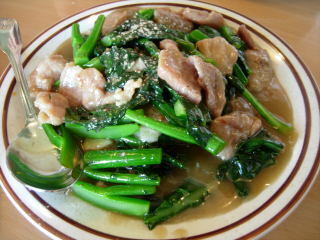 Chai Toong now serves Yai‘s lard na (meat and Chinese broccoli over rice noodles), which Thais say is one of the best in town, its crispy catfish salad and produces a better version of roast pork and Chinese broccoli than I had at Yai on Hollywood Boulevard. The combination of fatty pork belly cubes and crisp vegetable was unpleasantly greasy there. At Chai Toong it is crisp, dry and almost fat-free. Not everything is the same. One friend got up and left when a dish that he dotes on at Yai wasn’t on the menu. I’m sure he’ll be back once he hears that Chai Toong puts out excellent food. Just one example: crisp, fried fish, pla lui saun, handled in an innovative way that made a Thai chef friend sit up and take notice. 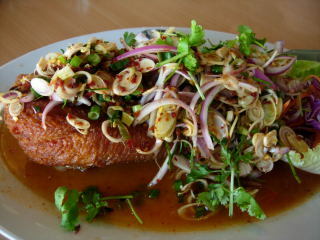 After the backbone is removed, the fish is turned inside out, fried and covered with sliced lemon grass, red onion and spicy sauce. The sweetened red curry sauce for deep-fried catfish slices is based on curry paste made at the restaurant, not taken from a can. 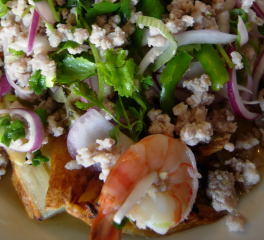 The eggplant salad is the best I’ve had—smoky, fire-roasted eggplant covered with ground pork and decorated with shrimp. A wall menu in Thai offers jungle curry, a standard but very good version of papaya salad and delicious, glistening dark pork ribs that are sour and slightly fermented. 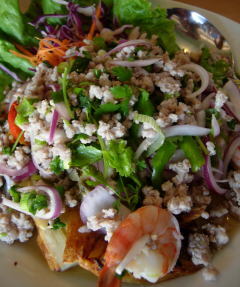 Or you can stick to popular standards such as pad Thai, red curry, chicken-coconut soup and beef salad. Or try a $4.95 lunch combination. 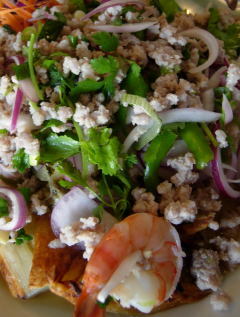 The restaurant name is spelled two ways—Chai Thung and Chai Toong, the latter closer to the Thai spelling. Oddly, it opens into Betsy’s Filipino bakery next door so that the aroma of freshly baked bread occasionally adds a new note to the intricate seasonings that make Thai food so compelling. 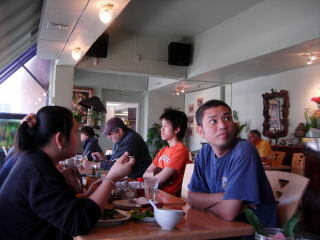 Chai Toong Thai restaurant, 1001 N. Vermont Ave., Los Angeles, CA 90027. Tel: (323) 667-3432. Open daily 11 a.m. to 11 p.m. Lunch special 11 a.m. to 3 p.m. Monday through Friday. It’s not nice to miss out on something really good. But that was the plight of hundreds (was it thousands?) of people who attended the Thai New Year Festival in Hollywood. 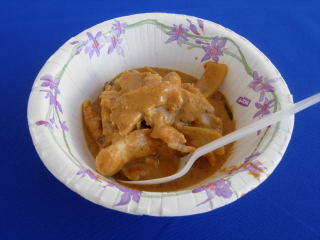 What they missed was a taste of Chef Jet Tila’s silky, sumptuous chicken panang curry. Tila prepared a massive amount in a giant pan, but it still wasn’t enough to provide samples for more than a handful of those who watched his cooking demonstration. Tila’s panang combines the key elements (sweet, salty, sour and spicy) involved in the taste sensation that Thais call yum and we call yummy, plus the fresh herbal flavors of kaffir lime leaves and Thai basil. Luckily, there is still a way to taste Tila’s panang, and that is to make it yourself, with his recipe. It’s an easy dish, once you’ve accumulated the ingredients. Shop for them at Asian or Thai markets (I found everything at the Bangkok Market, 4757 Melrose Ave., Los Angeles, CA 90029). 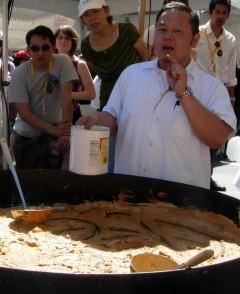 The photo shows the panang dished up at the festival. Instead of chicken, you can make it with shrimp or tofu, Tila says. The outcome will be the same—yummy. Open one of the cans of coconut milk without shaking. Spoon out 1 1/2 tablespoons of the thick milk at the top and set aside. Measure enough additional milk from the cans to make 3 cups. Reserve the remaining milk. Stack the lime leaves and roll them up tightly, then cut the roll crosswise into very fine shreds. Set aside. Heat the 1 1/2 tablespoons thick coconut milk in a large saucepan or Dutch oven. Stir in the curry paste and shredded lime leaves. Cook and stir for 30 seconds to 1 minute, or until the paste starts to brown. Stir in the remaining measured coconut milk and bring to a boil. 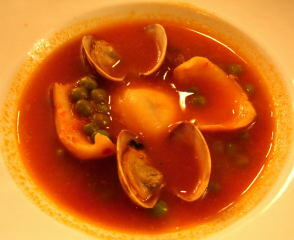 Boil gently, uncovered, until slightly reduced and thickened, 8 to 10 minutes. Reduce the heat and stir in the tamarind paste, fish sauce and sugar. Add the chicken, kabocha squash, bamboo shoots and onion. Tear the basil into the pan. Simmer, stirring often, until the chicken is cooked through and the squash is slightly tender, about 15 minutes. The sauce should be thick but still fuid. If it has thickened too much, thin with some of the reserved coconut milk. 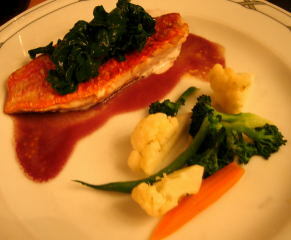 To serve, garnish with sliced bell pepper and accompany with steamed jasmine rice. 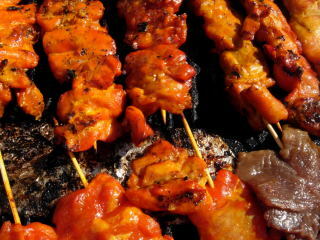 Read about food, wine and journeys that wander from Tunisia to the California desert in an online magazine that you can see by clicking on this link: http://www.global-writes.com. The articles are written by an international group of professional writers who, if you combine their resumes, have been almost everywhere, eaten almost everything and sipped the best wines. Save the link so that you can see future issues of Global Writes, which is edited by Kim Rahilly and features the work of members of the International Food, Wine, & Travel Writers Association. You may never have seen French toast--pardon me, pain perdu--like that at Café Laurent in Culver City. Instead of the usual browned bread slices, you get a golden pancake compose d of crumbled brioche, croissants and raisin rolls, with a few cranberries mixed in for jaunty color and powdered sugar over the top. Syrup too, as much as you need. The name pain perdu is French, like the café’s owner/chef Laurent Triqueneaux. It’s a breakfast item, served only until 11:30 a.m. weekdays, but all day on weekends, a good time to linger over coffee in the café’s pleasant patio garden. 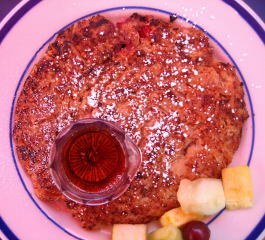 Pain Perdu (French toast) is $8.75 at Café Laurent, 4243 Overland Ave., Culver City, CA 90232. Tel: (310) 558-8622. Open from 7:30 a.m. to 2:30 p.m. Tuesday through Sunday. Scoops isn’t news any more. 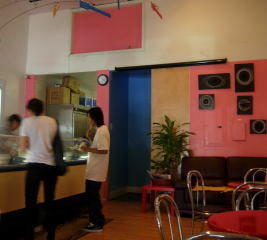 All ice cream lovers know you can drop in for an always changing panorama of exotic flavors. The two I chose the other day were relatively ordinary compared to such wild concepts as bacon, kimchi and foie gras ice cream. But what a lovely combination—pale green pistachio-cardamom with a side of vegan red tea (creamy with soy milk). It was like having ice cream with tea on the side, only the tea was frozen too. Ice cream is $2.50 a scoop at Scoops, 712 N. Heliotrope Drive, Los Angeles, CA 90029. Tel: (323) 906-2649. Open Monday through Saturday from noon to 10 p.m. Closed Sunday. If you’re craving really fresh bread, go to Betsy’s Bakery on Vermont Avenue in Los Angeles. There, pan de sal comes out of the oven every 20 minutes. These big, soft Filipino rolls are marvelous, as only just-baked bread can be. They’re wonderful for breakfast, with dinner or for sandwiches. I remember tasty adobo (pork) sandwiches in the Philippines, the light, sweet bread (yes—it’s sweet, not salty, although pan de sal means salt bread), was as much of a treat as the filling. Betsy’s stacks pre-packaged pan de sal on the shelves. But why not get a paper sack full of steaming rolls just out of the oven? With the 20 minute schedule, you won’t have long to wait. 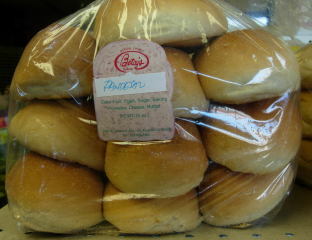 Fresh baked pan de sal is $2 for 10 rolls at Betsy’s bakery, 1001 N. Vermont Ave., Los Angeles, CA 90029. Tel: (323) 665-7483. Open daily from 8 a.m to 7 p.m. Temperatures in the high 90s in Los Angeles weren’t so different from temperatures in Thailand. And they certainly didn’t stop hundreds of people from strolling along the booths at the Thai New Year Festival on Sunday in Hollywood. The festival celebrates the holiday Songkran, when it’s traditional to douse people with water to clear away the bad from the previous year. Songkran takes place in mid-April, the hottest time of the year in Thailand, which may also explain this watery custom. I only got squirted once, and that cool shower was a godsend in the heat. Food booths selling sate, pad thai, papaya salad, mangoes with sticky rice and much more did such good business that the food ran short before sundown. An outdoor Singha beer café provided liquid first aid to sweltering festival goers. 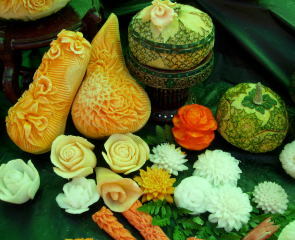 Proud of their culture, Thais strung flowers into pretty garlands, carved fruits into intricate designs and displayed delicately molded Thai sweets. Booths sold carved wooden elephants, Thai parasols, Thai CDs and many other things. Thai kick boxing occupied one stage, and a curry cooking contest drew onlookers avid for tastes of panang curry, green curry and even Indian curries. A couple of Indian restaurants, Nawab of India and Bombay Café, had entered the competition and wound up among the finalists. The winner was a curry submitted by the Thai Community Development Center. The demand for samples was overwhelming. 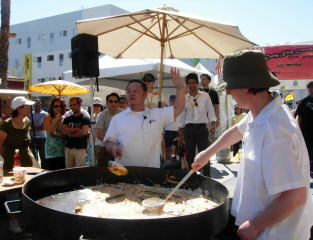 I was lucky to get a taste of one entry, a delicious, creamy chicken panang prepared by Thai chef Jet Tila. It was smooth, rich, spicy and wonderful. As soon as I get the recipe from Chef Tila, I’ll let you in on how it’s made. But for now, I can report that the key ingredients are panang curry paste, coconut cream, fish sauce, tamarind, kaffir lime leaves, Thai basil and chicken or any other meaty ingredient, even tofu. Panang curry is easy to make, at least it looked that way as Chef Tila poured ingredients into the biggest pan that I have ever seen.